Here is where you'll want to enter a few words or sentences about the Event/Membership you are creating. See the example below. This option is not always available to you as an Event/Membership organizer. These options are dependent on the Event/Membership template you choose. Simply check the box next to the product or service the Event/Membership host will provide to event participants. Here is where you as the Event/Membership organizer have the ability to choose a photo or photos that will be used to market your Event/Membership. You will first see one default image based on the template you originally chose. 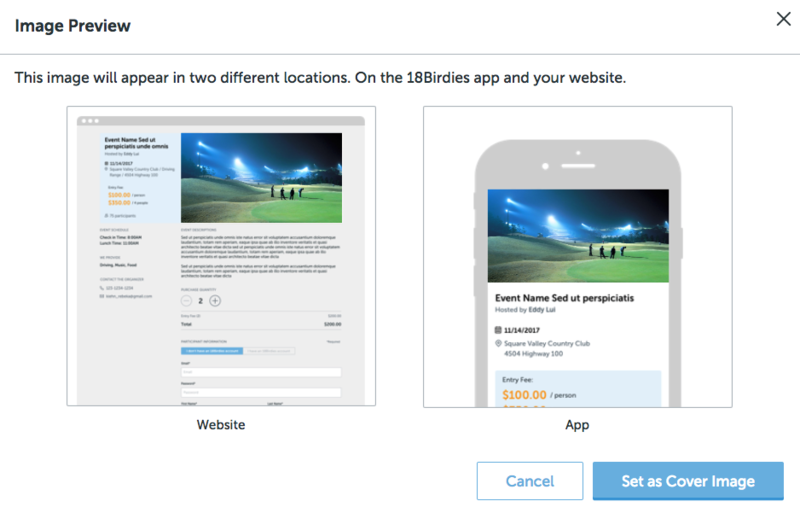 Hover your cursor over the image to either (1) Preview the image to see how it will appear on the registration website and on the 18Birdies app registration page, or (2) Trash the image by choosing the trash can icon. Simply click the empty photo square to upload an additional photo to the Event/Membership images. The green border around the default image indicates that is the image that will be displayed as your cover page image. Hover your cursor over new images you've uploaded to set a new cover page image. Some Event/Membership you create may have limited space. If you wish to limit the number of participants for the Event/Membership, simply enter that maximum number here.